America’s health care plight frequently snags headlines, but the industry is particularly top of mind as the open enrollment period approaches. Meanwhile, employers are faced with decisions and uncertainties, as they navigate the system in attempts to promote and maintain health across their respective workplaces amid a divisive presidential race with polarizing ideas about what health care in America should look like. 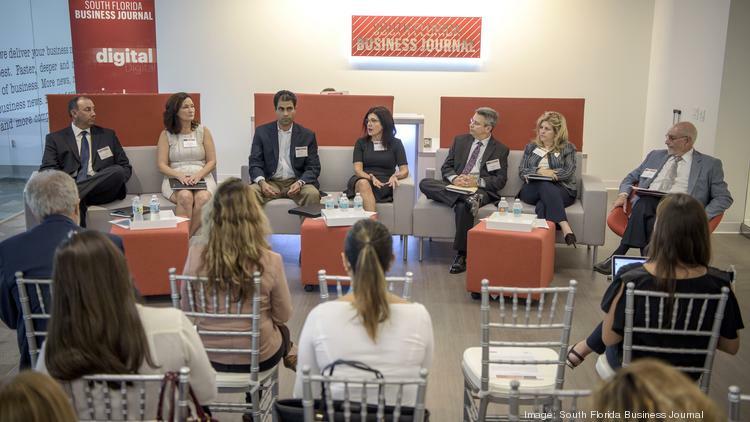 South Florida business leaders gathered at the Business Journal’s Miami office on Oct. 21 to discuss present-day challenges, triumphs and what may lie ahead as part of Critical Conversations in Health Care. Critical Conversations is the Business Journal’s ongoing series examining key issues in business. Senior reporter Brian Bandell moderated the discussion, among seven health care experts across various rungs of the business ladder, dishing out questions that yielded insights and informed audience members about the progression of nationwide health care regulation. Accounting, tax, audit and consulting services firm BDO sponsored the event. Among the lessons learned was how the presidential race may impact the Affordable Care Act, how wellness programs take shape in South Florida companies and the role technology is set to play in health care. It is often said that the only constant in life is change, but the idiom deserves an update since the emergence of the Affordable Care Act. Introduced in 2010 by the Obama administration, the massive overhaul of the country’s health care system remains a hot topic that’s front of mind for many employers and consumers. That’s especially true amid the finals days of the presidential campaign, where the fate of the system, known as Obamacare, is in question. Republican presidential candidate Donald J. Trump fervently contests its efficacy, calling it “a disaster” on various occasions, and promises to do away with it. His opposition to the plan urges employers across the country to imagine a world where Obamacare is repealed and a whole new system is created, hashed out and, ultimately, implemented. For some, that possibility is alarming. “I’d be so overwhelmed, like ‘Are you kidding me?’ for it all to disappear,” said Connie Chiara, president and CEO of Corporate Benefit Partners, a Boca Raton-based employee benefits brokerage and consulting firm. Understanding just what Obamacare is and does can be daunting to just about anyone because its complexity is widespread and its mechanisms multifaceted. For a consulting firm, it is likely a challenge of biblical proportions. Corporate Benefit Partners was tasked with breaking down the massive system into digestible information to best advise clients. The goal of Obamacare was to create competitiveness across the health care industry, a historically complicated and opaque sector. An online marketplace, also known as “the exchange,” was created, working to encourage participating insurance companies to be transparent about cost and offerings, similar to what Expedia does for travel companies, effectively lowering price and eliminating confusion. On the business side of things, Obamacare required employers to provide health care, among other things. Not all were as impacted as Corporate Benefit Partners. Upendra Mody, VP of Total Rewards for automotive company JM Family Enterprises, said Obamacare hasn’t significantly impacted the company, a leading national car retailer. For the most part, its effects materialized only through a certain subset of plans offered in the marketplace known as “Cadillac plans,” Mody said. As the name suggests, these plans offer high-quality, comprehensive care. They come with high premiums, a term that refers to plans’ monthly costs. Therein lies the challenge for companies looking to provide their employees the best possible care, said Rich Ducharme, director of sales for Sapoznik Insurance in North Miami Beach. “If I’m paying more to give my employees great coverage, I’m going to be taxed on that,” said Ducharme, whose duties include development and coaching of new benefit consultants. At this juncture, the tax expert in the room chimed in. CPA Jeff Kramer, a partner with BDO, said one reason for the paradoxical mechanism is the government’s desire to increase its tax revenue. Kramer said that, with all the complexities and costs, he is surprised more of his clients did not approach him about alternative routes. In fact, Kramer said, the number of employers providing coverage hasn’t changed much since 1996. Participation by individuals not covered by employers, on the other hand, has changed, with insurers seeing a 20 percent increase in members since the implementation of the Affordable Care Act. The volume of uninsured Americans has also changed, according to Jessica Lerner, executive VP and COO of Community Care Plan, an organization that services Medicaid, Children’s Medicaid Services Network and other segments of the population. However, panelists said, there certainly is room for improvement. The cost of health care continues to rise, on pace to account for 20 percent of the U.S. gross domestic product – about twice that of many developed countries. Something’s got to give, Mody says. Another consensus also emerged from the conversation: Obamacare is most likely here to stay, in some form or another. Lerner echoed his thoughts, recalling the early days of Medicare. She expects the same trajectory to unfold for the Affordable Care Act. Employers know that, beyond a competitive salary, employees prioritize competitive health care benefits when choosing where to work. “It’s important to be a competitive employer in the South Florida market, but also nationwide, and it’s important to have a pulse on what new employees and existing employees are looking for,” said Ana Alfonso Ribeiro, VP of human resources for CareCloud, a Miami-based health-care technology company that recruits some of its employees from outside the state. The problem for businesses, however, is working through a variety of hurdles to actually provide quality coverage. For one, the system itself is complicated. It is a balancing act, he says, where employees must weigh current necessities, the unexpected and the cost for both. Add children or spouses to the equation and the confusion piles on. Upendra Mody, VP of Total Rewards with JM Family Enterprises, pointed to cost as the No. 1 concern of employees at JM Family, a diversified car company that ranks 21st on Forbes’ America’s Largest Private Companies list. Sorting through the financials of health is no easy task, even for experts. Jeffrey Kramer, a partner at the Fort Lauderdale ofice of accounting firm BDO, can attest to that. The role of an employer, then, is to demystify health care for its employees, Mody said. “That’s where tools like GuideSpark — [a tool for HR personnel to help educate employees on rewards packages] — come into the picture. You can watch it on your desktop or your phone. They’re short videos, because that’s the attention span of all adults these days,” he said, laughing. But even with costs laid out, higher premiums don’t always equate to higher quality care, Oller said. It puts the onus on businesses to demand information and transparency. “When an organization is beginning to choose the carrier for their employees, they should ask for metrics, outcome figures — ‘I want to know how you’re doing with value-based services.’ That information is available,” he said. But it doesn’t always come easy, emphasizing the need for employer-provided insurance. As innovation in the technology space further permeates business models, even the most forward-facing and human-interaction-based industries are getting a makeover. Health care is no different. The advent of telemedicine — the remote diagnosis of patients by doctors via telecommunications technology — has made long wait times and reception-room agony a thing of the past, enabling benign ailments or infections and workday productivity to coexist, once and for all. Sapoznik Insurance Sales Director Rich Ducharme can attest to the wonders of telemedicine. When he woke up one morning before work with a stye, telemedicine saved him hours. “You go to the telemedicine kiosk for the allergies, the styes, the cold and coughs of the world; you get your prescription at lunch; and then you come back to work,” he said, adding that the alternative — waiting for a doctor, being diagnosed, picking up medicine — would have cost him more than half of a workday. “That return on investment [of providing telemedicine services to employees] can’t be tracked yet, but it will be down the road,” he said. The new resource solves what Ducharme calls a double-edged sword. Employers want their employees to be healthy, a state of being that requires maintenance, be it through routine checkups and the one-off visit for sudden ailments. But appointments rob workers of precious hours. With telemedicine, the process is exponentially streamlined and sped up. Employees appear to be equally excited, according to Jessica Lerner, executive VP and COO with Community Care Plan. Telemedicine is available to employees of the Sunrise-based company, an organization that services Medicaid, Children’s Medicaid Services Network and the uninsured population of South Broward, among other things. “It’s been about 4,000 visits so far,” she said. “And it’s reducing costs from an ER standpoint,” by providing an alternative means to the same end: immediate attention for a sudden condition. Some employers have taken to providing quick care in other ways. Upendra Mody serves as VP of Total Rewards for JM Family Enterprises, one of the nation’s largest private companies. In this position, Mody is responsible for the human resources functions of compensation, health care and retirement benefits, workers’ compensation, and HR systems and analytics. At JM Family, he said, employees have access to on-site care clinics. “Instead of you guys going and wasting your time, we’ll have doctors here so they can take good care of you and you can get back to work really fast,” he said, describing the approach with which the clinics were presented to the company’s team in Deerfield Beach.